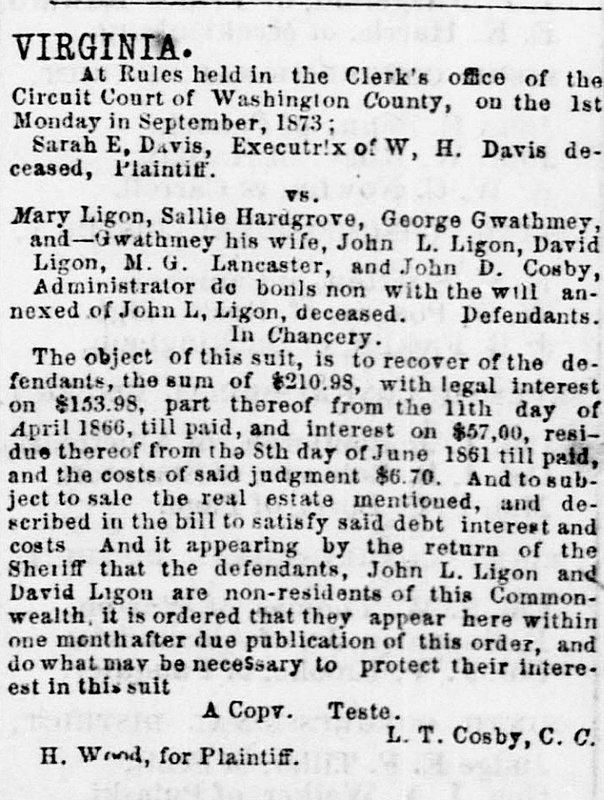 Reader Karen Ansley Krugman hit paydirt in the legal notices section of the Bristol News, a newspaper published in the twin border cities of Bristol, Virginia, and Bristol, Tennessee, in September of 1873. 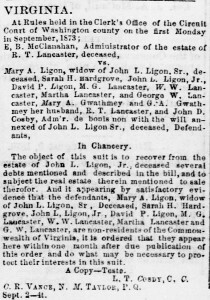 Published one after the other were notices of two suits being brought against Mary A. Ligon, widow of John L. Ligon Sr., and a whole list of other folks very likely to be close relatives of the deceased John. 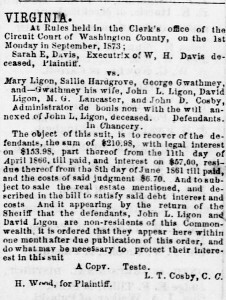 All of the named defendants were said to be non-residents of the Commonwealth of Virginia, so notice of the suits had to be published four times in the newspaper. And the nearest decently-sized city to the Washington County seat of Abingdon, Virginia, that had a newspaper was the state-line-straddling Bristol. But when Karen sat down with the notices, she ran into a snag. One of the parties named in each of the notices as a defendant was John D. Cosby, and both times he was identified as the administrator “de bonis non with the will annexed” of John L. Ligon Sr. And that’s a term she hadn’t run into before. What, she asked, did that mean? In early days, as today, when someone died owning property — either real estate or personal property — that needed to be distributed to the heirs, a particular individual was required to take charge of that property and make sure it was distributed properly (not to mention that any debts got paid and, more importantly from the public perspective, that any taxes got paid). What that person was called depended on whether he or she was chosen by the person who died and named in the deceased’s will or whether there was no will and a court or other local authority had to step in and choose someone. Seems pretty simple, right? But as Karen discovered, both executors and administrators come in different flavors. An executor can be general or special; instituted or substituted; rightful or executor de son tort; and executor to the tenor. Like executors, administrators can be general or special, but there are even more flavors within those two general types. Exactly when John L. Ligon Sr. died isn’t clear. He was certainly alive in 1860, when he and his family were enumerated in the City of Richmond.26 By 1870, however, his wife Mary Ann was listed as head of household in Washington County.27 Where the family was by 1873 if not in Virginia isn’t known. Ligon must have left a will or Cosby could not have been named administrator with the will annexed of any kind — that phrase means there had to have been a will in the first place. And there must have been an earlier executor or administrator, or one named for another part of Virginia, since Cosby was the administrator de bonis non with the will annexed — again, that first phrase signifies that only some of the estate still needed to be administered. 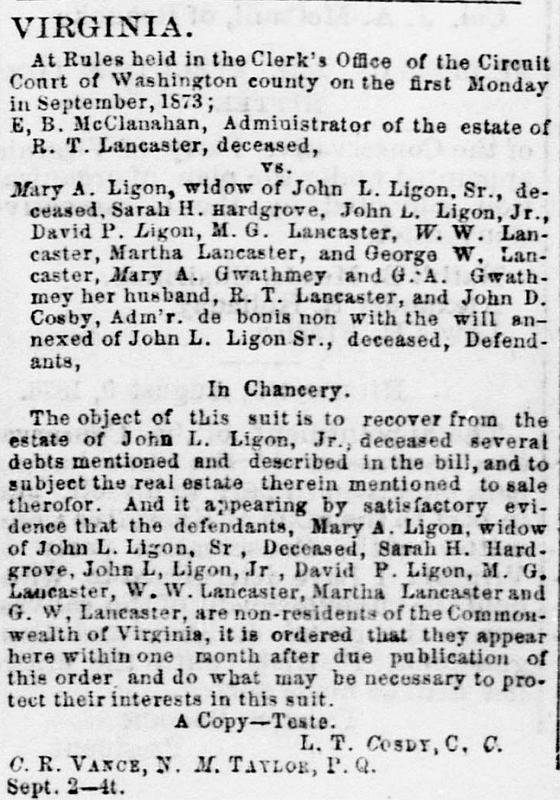 As long as Ligon died after 1865 (some court records were destroyed in fires in 1864 in Washington County and 1865 in Richmond28), then court records either in Henrico County or in Washington County should disclose who the original executor was and, perhaps, when and why John D. Cosby was named.